Ekornes Stressless Replacement Glide Wheel- Set of 2. 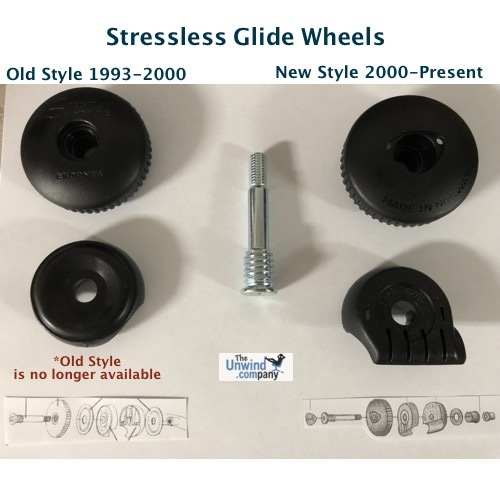 Please note that Ekornes changed the glide wheels around the year 2000 (actually between 2000-2002), so Stressless chairs produced at this time or before will not be compatible. *Please note that the small Stressless nameplate (which is purely cosmetic) that you remove to access the glide wheel bolt and the bolt itself is not included with the glide wheels from Ekornes, so are unavailable. Please use the existing ones on your Stressless chair. Please email us if you need assistance- We'll always do our very best. Perfect replacement for my chair. Followed instructions from web site and completed project in 15 minutes. I’m very happy with the parts, support & service. Thanks for providing support for Stressless chairs. I had to order new glide wheels for my Ekornes Stressless chair, since the original ones had literally fallen apart. The new ones appear to be straight from Ekornes, and they work just as new ones should. They are simple to change out; I trust they will last longer than the original ones did. I installed these after mine had worn out. They apparently have an inner gasket or layer of plastic/rubber that had worn off on my old ones. These were easy to install and so far work great. Perfect replacement for the accidental broken one. Thank you for the fast delivery to Canada. Set of 2 wheels are fine, but the nameplates (not showed) did not come, and are neither obtainable, with the set. Ekornes should include them as part of the replacement set.